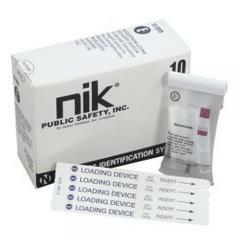 The NIK System of Narcotics Identification is the only international standard for field testing suspicious substances. NIK is also the only field test that has been awarded the ISO 9002 seal of excellence for quality control. Using state-of-the-art wet chemistry, the system presumptively identifies the most commonly encountered narcotic and street drugs. Individually sealed NIK Field Tests and factory-sealed boxes assure proper ampoule placement as well as advanced quality assurance and control. Test D is a specially Formulated Reagent System - for the presumptive identification of LSD (Lysergic Acid Diethylamide). 10 per box.